Tracert (pronounced trace route) is an examination of how traditional craft ideas translate into the modern multi-media networked world. 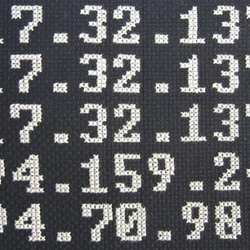 A sampler has been cross-stitched by hand from a transposed graphic of a tracert DOS command. The Aesthetics of Planned Obsolescence / Readymades Glitch Art. 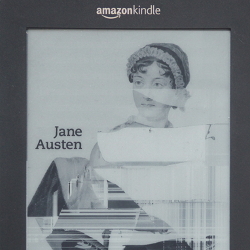 KindleGlitched is a series of glitched kindles donated, found or bought on eBay, signed by the artist. The generated visual are unique and permanent. No battery required. 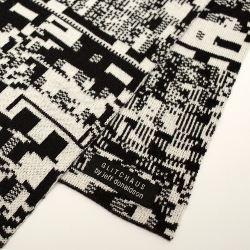 The 16bit Edition Glitch Scarf is a continuation of the exploration of glitch imagery as a new paradigm in textile design. Beginning in 2001 by preparing video game systems with wires to alter their function, textile renders of 8bit glitch patterns began with the 1st edition, 8bit glitch scarf in 2007. Limited to 20 pieces, the pattern was created with a prepared Nintendo Entertainment System then, rendered as a wearable glitch knit at a 1:1 pixel to knot ratio. The 16bit Edition Glitch Scarf pattern was created with an Atari ST emulator running a classic demo scene release at a different resolution than it was coded for. A read error glitch result was then chosen and rendered as a glitch textile again at a 1:1 pixel to knot ratio.